Hello everyone! It's my turn to post over at Twine It Up with Trendy Twine today. 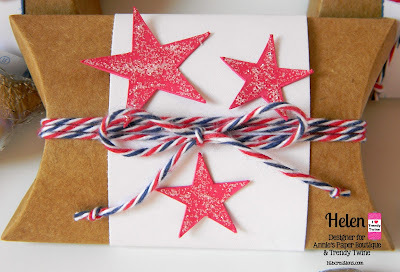 I am showing you the Small Kraft Pillow Boxes and Stars & Stripes Trendy Twine. These small boxes are so cute!! I was able to fit three Hershey's Kisses in them. They would make a great small favor or treat to give to a friend or co-worker. I wrapped a strip of white cardstock around the pillow box the I wrapped the Stars & Stripes Twine around the other way and tied a bow. Lastly, I added some red stars I cut out with my Cricut and topped those with some Frosted Lace Stickles. These were quick and fun to make!! 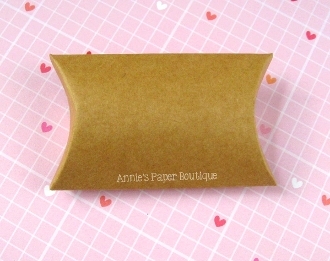 Be sure to go over to Annie's Paper Boutique to get all you twine and packing goodies! A great way to give a small treat! 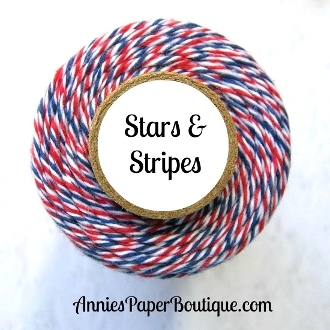 I love that stars and stripes Trendy Twine. Cute boxes!! I love your details! Awesome way to decor the pillow boxes!! These are so adorable Helen!!! Love these Helen! 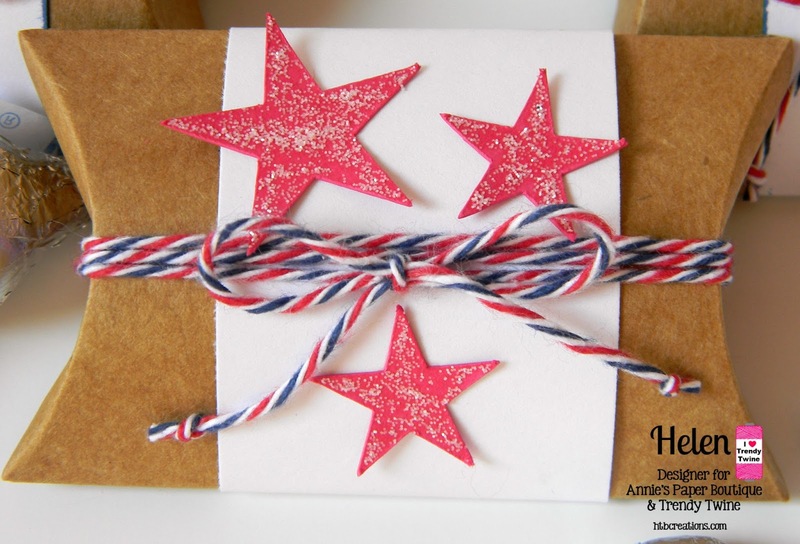 I love the stickles on the red stars, they look fantastic! Super fun pillow boxes! Those Stickled stars look so awesome! Great treat boxes! 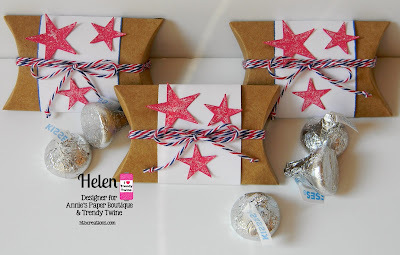 Love your glitter stars and the big twine bows in the middle!